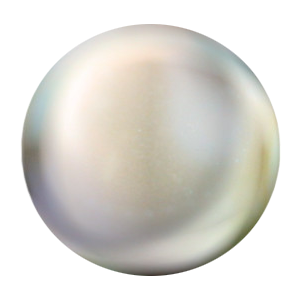 A pearl is a hard object produced within the soft tissue (specifically the mantle) of a living shelled mollusk. Just like the shell of a clam, a pearl is composed of calcium carbonate in minute crystalline form, which has been deposited in concentric layers. 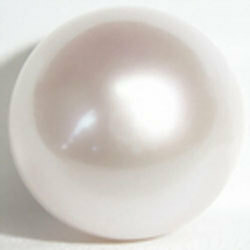 The ideal pearl is perfectly round and smooth, but many other shapes (baroque pearls) occur. The finest quality natural pearls have been highly valued as gemstones and objects of beauty for many centuries. Because of this, pearl has become a metaphor for something rare, fine, admirable and valuable. The most valuable pearls occur spontaneously in the wild, but are extremely rare. These wild pearls are referred to as natural pearls. Cultured or farmed pearls from pearl oysters and freshwater mussels make up the majority of those currently sold. Imitation pearls are also widely sold in inexpensive jewellery, but the quality of their iridescence is usually very poor and is easily distinguished from that of genuine pearls. Pearls have been harvested and cultivated primarily for use in jewellery, but in the past were also used to adorn clothing. They have also been crushed and used in cosmetics, medicines and paint formulations. Whether wild or cultured, gem-quality pearls are almost always nacreous and iridescent, like the interior of the shell that produces them. However, almost all species of shelled mollusks are capable of producing pearls (technically "calcareous concretions") of lesser shine or less spherical shape. Natural pearls are extremely rare, incredibly expensive and typically small. Therefore people have developed ways to culture pearls, so that these beautiful gemstones can be enjoyed by many. In cultured pearls, some tissue or a mother-of-pearl bead is introduced into the mollusc shell. If successful, this process induces the animal to form a "pearl sac" whose cells secrete a layer of brownish protein called conchiolin over the irritant. This is followed by the secretion of numerous mineral layers of nacre composed of calcium carbonate in thin overlapping plates. 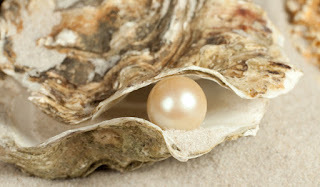 Pearls can come from fresh or seawater molluscs. The beauty of pearls is that they can be plucked from the shell naturally beautiful, fully-formed and displaying perfect lustre with no need to be cut or polished. The oldest recorded reference to pearls in history is the 7,500 year-old "Umm Al Quwain Pearl", which was found in a grave in a place that is now known as the UAE. 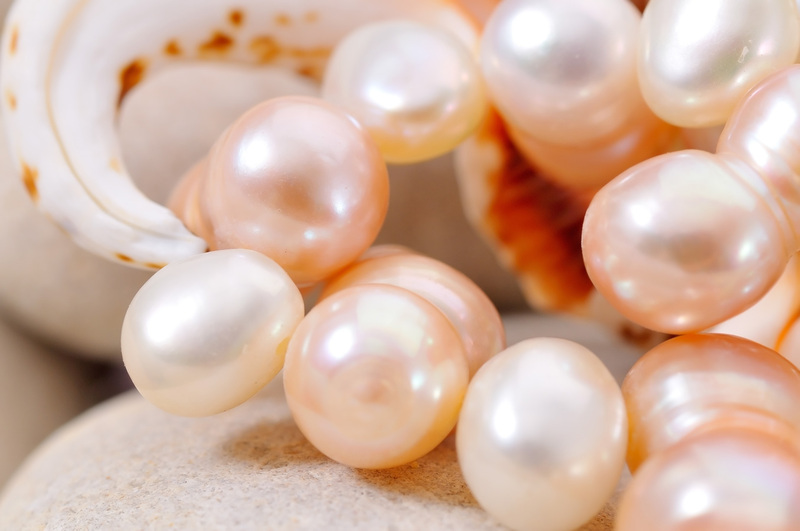 Before pearls were cultured by man, they were harvested from the Persian Gulf, Sri Lankan waters, fresh water sources in China and the rivers of Europe. Later, Christopher Columbus discovered pearls in South America. 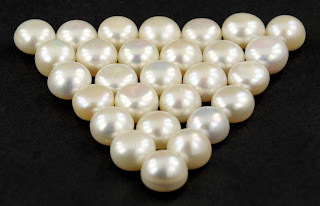 When these natural pearls were almost depleted in the early twentieth century, the Chinese and Japanese began to culture pearls and the rest is history. Nowadays, pearls remain a treasured adornment and are cultured all around the world. 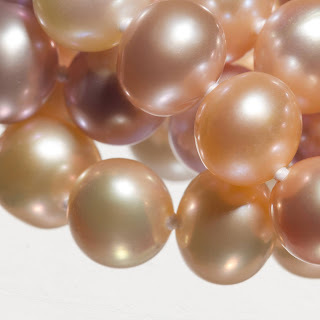 Pearls can be identified by their pearly lustre and when rubbed gently against the teeth, a slightly rough surface texture can be detected, whereas imitation pearls feel smooth. The surface appearance of natural and cultured pearls is the same, but the density of cultured pearls is usually higher, at approximately 2.73 for most. The only definite way of distinguishing between natural and cultured pearls is to examine their internal structure. Experts use endoscopes to do this through the drill holes of pearls. Natural pearls have concentric internal layers. Pearls are found and cultured in waters all over the world. Natural sea pearls are found in Australia, Japan, Central America, the Persian Gulf, the Gulf of Manaar (between India and Sri Lanka), the coast of Madagascar, Burma (Myanmar), the Philippines, the South Pacific Islands (including Tahiti and Fiji) and South America. 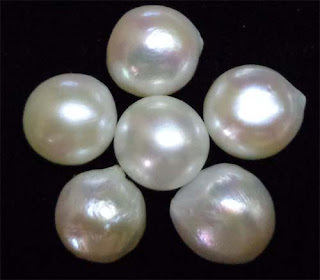 Cultured seawater pearl sources include Southeast Asia (such as Indonesia and the Philippines), Australia, China, French Polynesia, Japan, South Pacific Islands (including Tahiti and Fiji) and the Philippines. 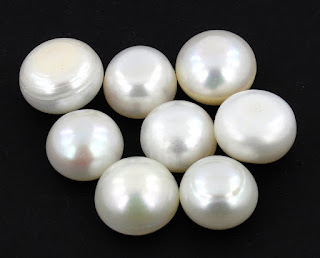 Basra pearls where basra moti in the Indian language, natural pearl gemstone which are found in the Indian Ocean are also called as basra pearls. Pearls are available in a variety of colours. Colours of pearls include the following: White, pink, silver, cream, golden, green, blue and black. 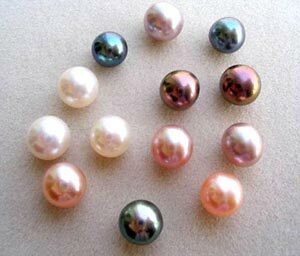 Some pearls exhibit iridescence, which is known as orient. The lustre of pearls depends on the quality of the nacre. Pearls should have the characteristic shiny pearly lustre and their surface should show sharp and bright reflections. 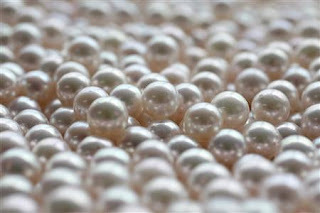 The surfaces of good quality pearls are smooth and blemish-free with a suitable layer of nacre to increase durability. Pearls can be round, oval, pear-shaped or misshapen (baroque pearls). However, the best materials are regularly shaped. The most valuable shapes are symmetrical spheres or symmetrical drops. Pearl sizes depend on the type of mollusc that they form in and they typically range from 2 mm to 16 mm in diameter. Pearls are often bleached to lighten and enhance their colour. In this way, a uniform colour can be achieved for beaded necklaces. Pearls symbolise Purity, Spiritual Transformation, Charity, Honesty, Wisdom and Integrity, all the best within us. Pearls provide a clear vehicle for the advancing states of wisdom, as well as a clean channel for receipt of spiritual guidance. The ragged, rough grain of sand, transformed over time slowly growing into a object of great value and beauty. With it's humble beginnings, Pearls symbolise innocence and a pure heart, and help us get in touch with the simple honest things of life. Pearl grants to its wearer extraordinary foresight, protects him from risky commercial transactions and from evil eye. Pearl's magical properties depend on its colour: white Pearl brings freedom, brownish - wisdom, yellowish - wealth, greenish - happiness. Pearls are considered to be very effective in treating health issues related to the stomach, heart and spleen. It calms the mind and prevents hysteria, promoting mental stability.It was believed that Pearl boosts sexual energy, strengthens visual acuity and heals ears diseases. It is beneficial for heart, lungs (against tuberculosis, asthma, chronic bronchitis), kidneys, urinary system and liver. Pearl possesses sedative and also laxative effect, neutralises poison, lowers acidity, It relieves conditions of bloating and biliousness. Pearl increases fertility and eases childbirth. Pearl also raises sensuality. Pearl was believed to be the main ingredient of "immortality elixir". Orthoclase is a mineral that belongs to the family of silicate minerals called feldspar. The deference between the feldspars and the other silicates is that the former contain a mixture of the following chemical elements: Potassium K, Calcium Ca and Sodium Na, in addition to the usual constituents of the quartz based minerals, such as Aluminium, Al, silicon Si and oxygen O. 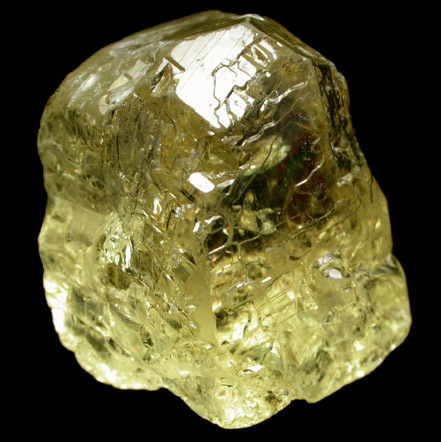 A typical orthoclase is a solid solution of KAlSi3O8 and albite NaAlSi3O8. The origin of its name is probably from the Greek name for e or transparent. The golden variation can be found on Madagascar and in Mexico. The other colours are more frequent. If of gemstone quality orthoclase resembles golden or yellow beryl, also known as heliodor. 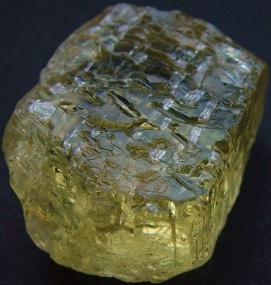 Orthoclase an important mineral for industrial applications. Amongst the other uses, it is a source material for porcelain production. Porcelain (the vitrified ceramic of white colour) is produced from a mixture of orthoclase, quartz and kaolin. Orthoclase is a rare gemstone that belongs to the feldspar group, which also includes moonstone, amazonite, spectrolite and labradorite. 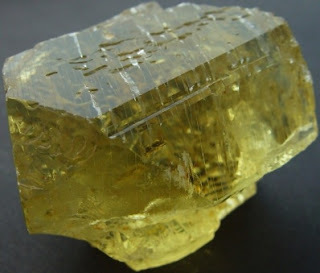 Therefore, orthoclase is sometimes also called "K-spar". 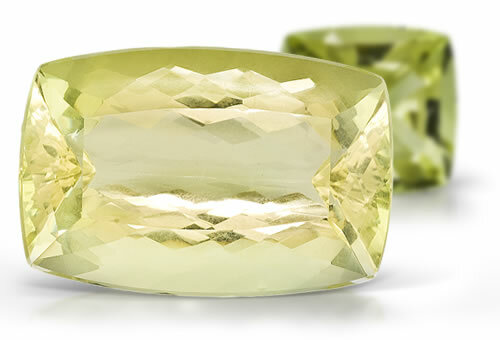 Orthoclase gemstones are typically champagne yellow, golden yellow or greenish, though they can be other colours. 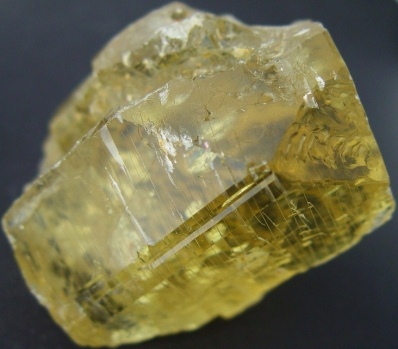 The name, "orthoclase" is a Greek word meaning "straight fracture", which refers to the cleavage planes of orthoclase being at right angles to each other. Orthoclase is faceted into attractive gemstones and also has an industrial use as a scouring agent in the making of some glasses and ceramics. 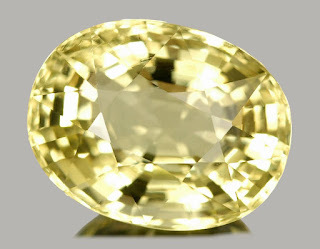 Orthoclase is difficult to identify from other gemstones by appearance alone. It can be distinguished from similar gemstones by its hardness, low birefringence colours and perfect cleavage. Orthoclase is often colourless or champagne-coloured, but it can also be pink, green, orange or bluish. Gem quality materials are typically champagne, golden yellow or greenish. Orthoclase is opaque to transparent and good quality specimens are eye clean. It has a vitreous lustre. Materials that display opalescence are classed as moonstone. 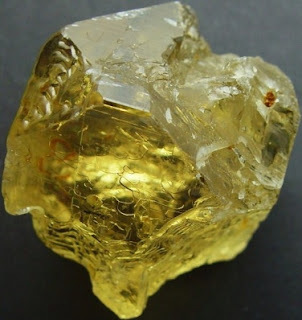 In the new age community, the pleasant and refined energies of this metaphysical semi precious crystal are associated with hope, new beginnings, better perception, and discernment. It can be useful for revealing emotional tensions. It can be used for chakra balancing and meridian activation. This stone of cooperation and group work, encourages finding novel and unconventional paths toward achieving our goals. Besides being useful in joint ventures, this gemstone encourages inner growth and conducting constructive actions and carefully planned agendas. Primarily associated with the solar plexus chakra, it can enhance our will and knowledge as to how to improve our relationship to the Universe and Its powers. 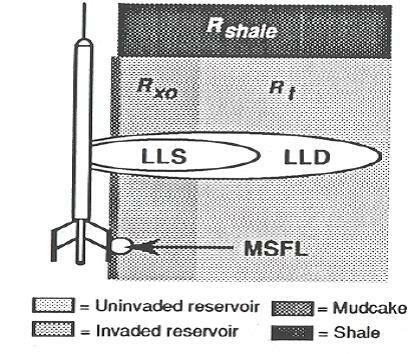 Different shale distributions in low resistivity log response. Technique : produce a current in the adjacent formation and measure the response of the formation to that current. By far the most important use of resistivity logs is the determination of hydrocarbon-bearing versus water-bearing zones. Because the rock’s matrix or grains are non-conductive and any hydrocarbons in the pores are also non-conductive, the ability of the rock to transmit a current is almost entirely a function of water in the pores. As the hydrocarbon saturation of the pores increases (as the water saturation decreases), the formation’s resistivity increases. 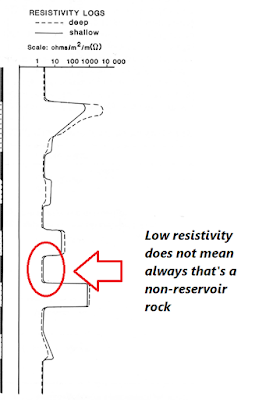 As the salinity of the water in the pores decreases , the rock’s resistivity also increases. Resistivity tools principle : there are two types of resistivity tool , The dual lateral log ( DLL ) and the induction log ( DIL ) both types measures the resistivity in three zones simultaneously. MSFL reads the resistivity close to the wellbore. 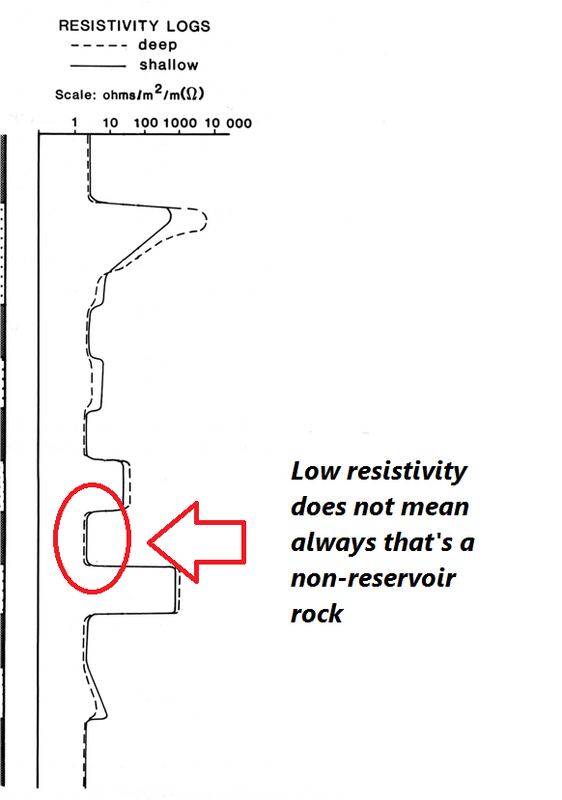 Low deep resistivity means : Shale or wet sand. Shale: Shale is defined as a fine-grained, indurated detrital sedimentary rock formed by the consolidation (by compression or cementation) of clay, silt, or mud. In petrophysical analysis, shale volume is one of the key answers used later to correct porosity and water saturation for the effects of clay bound water, (CBW). Shale can be distributed in several different ways, as shown below. 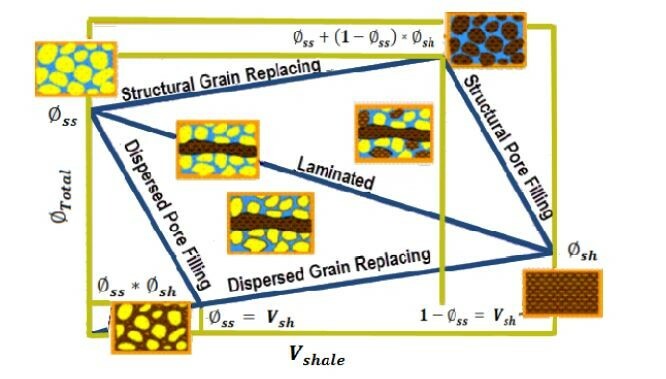 Laminated shale is a special case in petrophysical analysis. Standard models for porosity and saturation do not work. Dispersed shale is usually composed of from clay minerals that form in place after deposition due to chemical reactions between the rock minerals and the chemicals in the formation water. Structural shale is usually deposited as particles, grains, or clasts during the initial depositional phase. For example, the flooding of a river valley can carry mud or shale from surrounding areas. Different shale distributions have different effect on the sand reservoir. In a sand reservoir contain : it will affect the porosity and permeability of the reservoir and also it will lead to a shortcut in the resistivity log response , which may result in a miss lead in the interpretation of the reservoir porosity and saturation , it could be interpreted as sand bearing water instead of a sand contain dispersed shale. So, the question here is how to differentiate between them and to avoid this wrong interpretation ?! So in this case shale grains will replace sand grains ( volume of 70% ) , the shale will bring its 10% porosity with it. 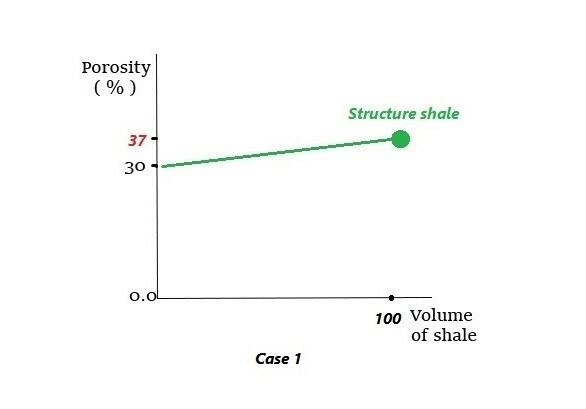 In the case of the presence of laminae shale , in this case shale will replace the whole reservoir ( 100 & ) and also will bring its own 10% porosity. 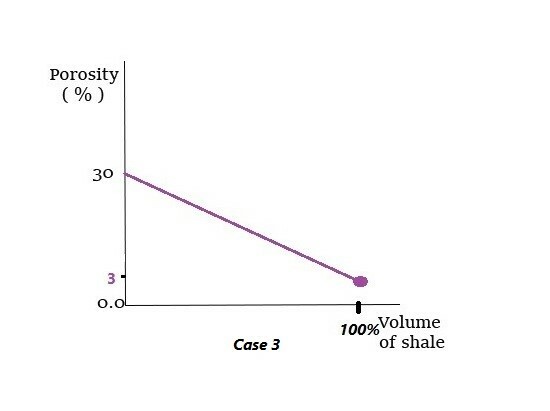 In the case of the presence of dispersed shale , in this case shale we will replace the porosity volume it self ( 30 % ) and as usual it will bring its own porosity. 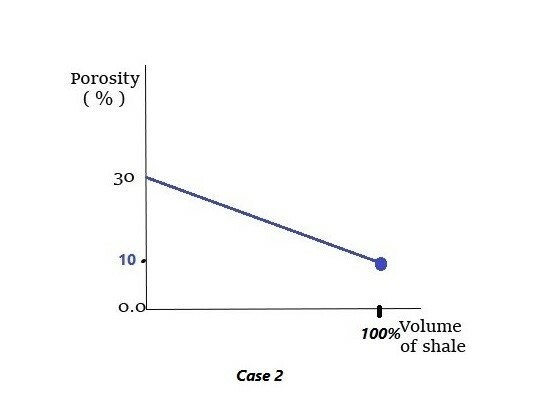 In other words , the porosity will be reduced into 3% ( 30 / 10 )Summarized figure for the different shale distributions in shaly sand reservoir and it’s effect on the reservoir porosity. So, we can differentiate between the three different types of shale distribution and according to the type we can make the right interpretation for the porosity and the saturation of the sand reservoir , also we will avoid the miss leading interpretation in the shortcut in the resistivity log. 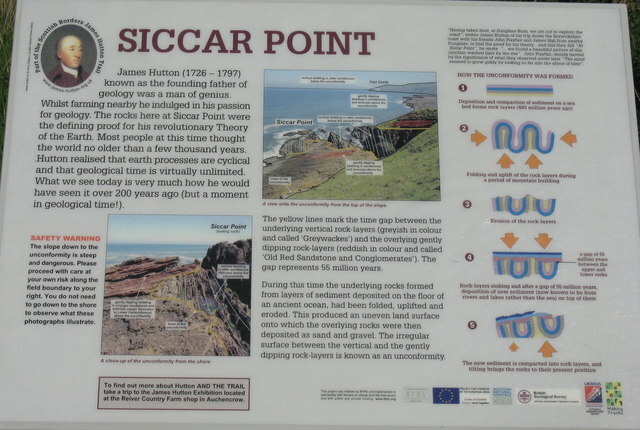 In 1788, James Hutton first discovered Siccar Point, and understood its significance. 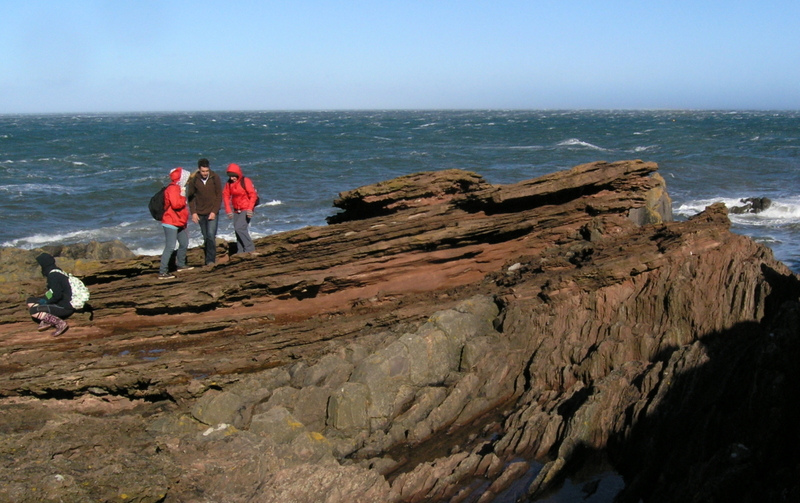 It is by far the most spectacular of several unconformities that he discovered in Scotland, and very important in helping Hutton to explain his ideas about the processes of the Earth.At Siccar Point, gently sloping strata of 370-million-year-old Famennian Late Devonian Old Red Sandstone and a basal layer of conglomerate overlie near vertical layers of 435-million-year-old lower Silurian Llandovery Epoch greywacke, with an interval of around 65 million years. Hutton used Siccar Point to demonstrate the cycle of deposition, folding, erosion and further deposition that the unconformity represents. He understood the implication of unconformities in the evidence that they provided for the enormity of geological time and the antiquity of planet Earth, in contrast to the biblical teaching of the creation of the Earth. 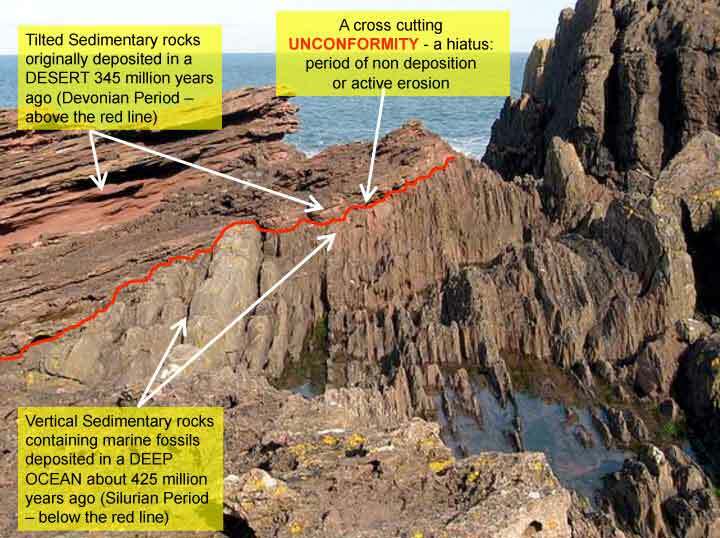 How the unconformity at Siccar Point formed. At this range, it is easy to spot that the contact between the two units is sharp, but it is not completely flat. Furthermore, the lowest part of the overlying Old Red Sandstone contains fragments of rock that are considerably larger than sand; some are at least as large as your fist, and many of the fragments in this basal conglomerate are bits of the underlying Silurian greywacke. 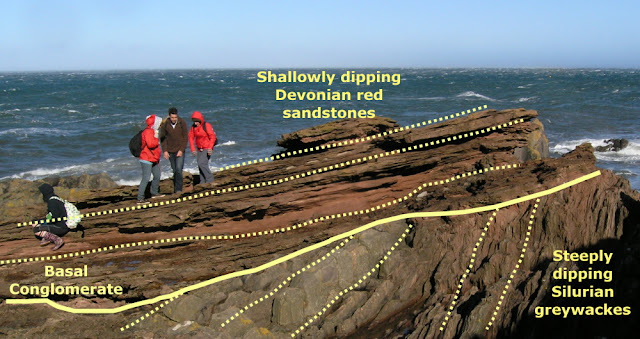 These are all signs that the greywackes were exposed at the surface, being eroded, for a considerable period of time before the Old Red Sandstone was laid down on top of them. 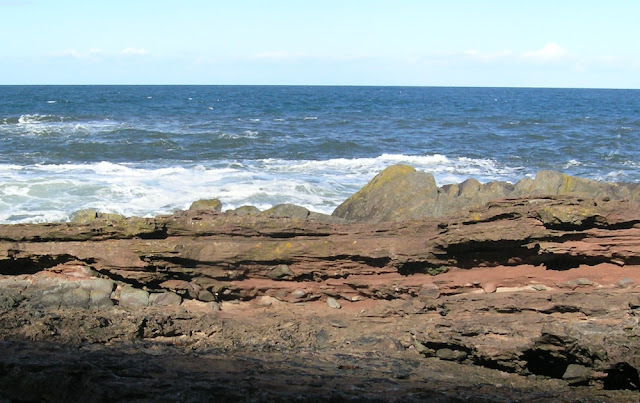 The Siccar Point which is a rocky promontory in the county of Berwickshire on the east coast of Scotland.